Baby's First Eye Exam - it's BABY time! At birth, your baby will not have all of their visual development. It is acquired over a period of time as they grow and learn from seeing the world around them. Good vision is vital to your baby’s development. They learn through seeing and doing. A baby’s first eye exam is the best way to detect any vision problems that may need correcting. Poor vision could be a major concern that might hinder your child’s development and result in milestone delays. 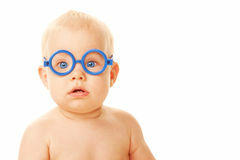 Often times parents don’t even realize their baby has poor vision until baby’s first eye exam. So how early should you bring your baby for their first checkup? Surprisingly, the majority of parents do not bring their baby in for an initial thorough eye exam until after their first birthday. 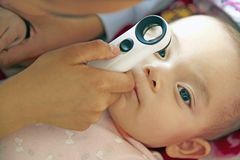 Your pediatrician will most likely check your baby’s eyes at each wellness check for any obvious concerns, although this isn’t a thorough eye exam. The American Optometric Association advises that babies receive their first eye exam by age 6 months from a pediatric optometrist. Early detection of vision problems in infants is crucial as the sooner a problem is detected, the sooner it can be corrected. Visual acuity testing at this age can detect problems such as nearsightedness, farsightedness, astigmatism, and lazy eye. Just as with other key aspects in infant development, you can help your baby develop their sight and build better vision through certain activities. From birth to 4 months: Newborns have very poor vision and are able to focus only on shapes and objects that are close by within 6 to 10 inches from their face. By the time infants reach their 4th month they should be able to follow a moving object with their eyes and begin reaching as well as recognize familiar faces, such as parents’ faces. To help your baby’s vision develop at this stage you can hang a mobile above your baby’s crib or install a baby-safe crib mirror so they can see their own reflection. Babies are also developing color vision at this stage so brightly colored and contrasting toys can help them learn how to distinguish different colors. 4 to 8 months: Around 6 months your baby’s visual acuity will improve significantly as well as color distinction. Hand-eye coordination and eye-body coordination have also improved and your baby should be able to reach for and grasp objects as their depth perception has developed. 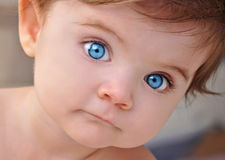 By 8 months, most babies will also have their permanent eye color, although it’s not uncommon for a subtle change in color to develop later. To encourage visual stimulation, try playing ‘hide-and-seek’ with toys by placing a small blanket or towel over a toy in front of them and watch them ‘look’ for it. Also use stacking toys to help develop hand-eye coordination. 9 to 12 months: During this time, babies will become more mobile as they are crawling and beginning to pull up to stand. Depth perception and distance should be well established to enable your baby to judge distance and throwing an object. Encourage hand-eye-body coordination by allowing your baby to crawl freely rather than focusing on trying to pull up to stand and walk. Light up toys are great for capturing baby’s attention to encourage crawling towards them. Reading is another great stimulating activity that you can do at any stage. Opt for board books with bright colored pages and allow your baby to tap at the pages as you read. By your baby’s first year, their vision should be near what it will be as an adult. Regular well-baby check ups and early eye exams are important in maintaining vision health. Does not follow an object with both eyes when you move it in front of them by age 4 months. Always consult with your child’s physician regarding concerns you may have about your baby’s health especially if you notice any of these symptoms prior to your baby’s first eye exam. Some of the symptoms mentioned above could be indications of an infection or other condition that requires medical treatment. Family history can also be cause for early eye exams if eye conditions or vision problem are very prevalent in a child’s immediate family.